Updates are downloaded automatically if the computer is connected to the internet. For the program to work correctly, you need to connect your computer to the internet and check for updates at least once a week. If you install updates less frequently than once a week, the program may run with errors: unstable work, device connection problems or incorrect statistics collection. In addition, the customers will have outdated versions of applications installed. Downloaded updates are installed manually, in the Updates tab. If there are dowloaded applications ready to install, the tab name is highlighted in red. 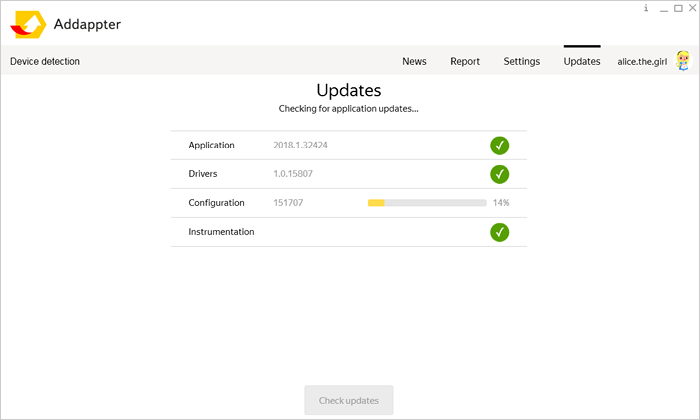 Addappter doesn't allow you to update a specific application — only the entire set of available applications and books. The number in the Configuration line means the version of the installed set. It doesn't depend on the number of applications and books in it. A set can include paid applications. The list of such applications is updated every time Addappter is launched. If there is no internet connection during the program startup, the list of paid applications is updated immediately after connection is restored. If the program doesn't download updates, make sure that the computer has internet access and try clicking the https://webdav.yandex.ru/ and https://cloud-api.yandex.net/ links. If the links don't open, contact your system administrator. If the links open, but the updates don't load, contact the support service. The set of applications in the program is constantly changing. Outdated applications and applications with low demand are removed from the configuration. If you want to add or remove some applications, contact the Addappter project manager in your store.